This recording from the Quatuor Danel and Finnish pianist, Paavali Jumppanen, pairs the relatively neglected Franck String Quartet with the F minor Piano Quintet. All of these performers have considerable expertise performing works from the Classical period and 20th Century so I was intrigued to hear how they would approach the late Romanticism of Franck. Franck wrote his String Quartet in 1890 and it was to be his last completed work. The four movements are tightly unified through use of a cyclic form and it is a relatively long work. I am not all that familiar with this piece but I was highly impressed with this performance from the Quatuor Danel. The first movement opens with Marc Danel’s sensuous melody soaring over a cushion of sound from his quartet partners. 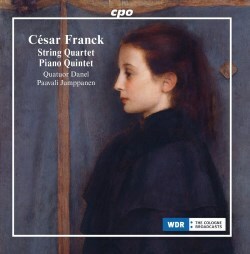 There is excellent rapport between the four members of the quartet in the ensuing Allegro as Franck’s sinewy melodic threads are woven together. The fugal section in the middle of the first movement is controlled well and the Quatuor Danel uses an impressive range of dynamics. In the Scherzo the players succeed in imbuing the string textures with a Mendelssohnian lightness while at the same time conjuring Franck’s troubling spectral shadows. All four players do an excellent job in sustaining the line in the slow movement and the evolving musical ideas have an organic feel. The opening statement of the finale in unison strings has a taut urgency as previous themes are taken up and discarded (a clear reference here to the last movement of Beethoven’s Ninth Symphony). The movement moves from charged kinetic energy to reflective musings as Franck’s web of musical ideas are taken up and synthesised. The Quatuor Danel navigate their way brilliantly through this complex web before drawing the work to its triumphant conclusion. The F minor Piano Quintet is performed more regularly than the String Quartet and there are impressive accounts by Richter and the Borodin Quintet and by Curzon and the Vienna Philharmonic Quartet. It was written a decade before the String Quartet and it is regarded as one of the composer’s greatest achievements. The premiere of the work was marred by Saints-Saëns who performed the piano part and to whom the work is dedicated. He walked off the stage, leaving the score open on the piano, a gesture which was interpreted as a mark of disdain. This performance from the Quatuor Danel and Paavali Jumppanen is very good indeed. In the opening movement passionate strings are punctuated with Jumppanen’s dreamy poetic musings on the piano. There is a tight interplay between all five players and the balance is excellent throughout. The climaxes of the movement are dispatched with a raw emotional intensity – this is unbridled playing that is very powerful and affecting. The shifting textures and chromatic harmonies of the slow movement have a whiff of decadence and capture Franck’s sensuous melancholy to perfection. The finale opens in ominous fashion before the ensemble join forces once again to give us an adrenaline-fuelled rush of exhilaration. Franck’s shifting textures are navigated with aplomb before all five players combine one final time to give us a virtuoso tour de force in the coda. For my money, the towering performance by Richter and the Borodin Quartet is still the best interpretation of this work, but this new recording contains very fine playing and is a substantial addition to the discography. Highly recommended.